It’s depressing that so many of the Leadership contestants seem to be colluding with Osborne’s deplorable policies instead of attacking them head-on. The simplest measure of overall economic performance is real GDP per head: in the UK’s case it is still, 8 years on, no higher than at the start of 2007 and still below its pre-crisis peak. At the end of last year UK real GDP per head was nearly 16% below where it would have been if the 1955-2007 trend had continued. Even Osborne’s boasted ‘recovery’ hasn’t shrunk this gap. This largely explains why living standards have remained so depressed. Or take productivity: UK output per hour is still 1.7% lower than it had been in February 2008. Such a long period of stagnation is unprecedented at least the 1800s. In the long run productivity determines standards of living. What is needed is fast productivity growth to match employment growth, but that has been lamentably absent because of the lack of buoyant demand. And it is that necessary element which has been crippled by prolonged austerity. As a result productivity growth has been dire: according to the IMF, UK GDP per head is only 72% of US levels, and behind Germany’s 84% and even France’s 74%. For all these reasons Osborne’s claim that the UK might be the most prosperous major economy in the world by 2030 is sheer fantasy, political bombast at its extreme. Osborne’s big club against Labour is that he has succeeded in paying down the deficit. But beyond a small degree he hasn’t. 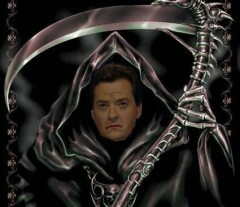 He boasted in 2010 he would have eliminated it by this year; in fact it’s still a whopping £92bn. Worst of all – and this is the central argument against Osborne – the austerity policy allegedly designed to cut the deficit is misguided and downright wrong. By far the most effective way to cut deficits is to resist recession and combine rapid economic growth with deficit reduction. This not a theory: it has been repeatedly proven in practice. The huge UK deficits after the Second World War (260% of GDP compared with 80% today) were easily subdued through rapid economic growth in the postwar years. Bill Clinton in his 8 years as US President did something similar. He inherited George W Bush’s huge deficit and ended with none largely because of fast economic growth. Again, the much-praised reduction of the Swedish budget deficit during 1994-8 was achieved in a period of fast growth of GDP. In the US today, despite political deadlocks, the ratio of deficit to GDP has fallen due to economic growth. Jeremy Corbyn needs to promulgate these truths loud and clear. If he does, Osborne for the first time in 5 years will be held to account as the reckless failure he is. Expecting Jeremy to clear up the misunderstandings of how to correctly deal with the deficit after a whole crowd of Social Democrats ran an entire General Election campaign without this message may be a tall order. Three other leadership election candidates giving no support makes his case even more difficult. He only has a limited amount of media time and attention (much taken up with dealing portrayals of Left eccentricity). Without a strong base of Socialist support one candidate has an impossible job on his own. Therein lies the great value of having a Left candidate at all – it helps to build for the future in addition to what we need do now. Yes and at least Jeremy Corbyn is the Anti-Austerity candidate. He is also likely to be the ONLY candidate to agree with giving power back to members via Conference, and to CLPs re shortlists and candidates, so for Labour members a vote for Jeremy Corbyn is a vote to empower themselves! I hope Jeremy will also argue for a minimum membership fee of something like £5 and the rest pay on a sliding scale based on income to help us to build a mass party- and we need to give more of a voice in the Party to those who are being crushed by the Tories. At least Jeremy like a number of members is free of the Neo-Liberal straight jacket and is for genuine change. I wish our cause success! I have been waiting for five years for Labour to start acting as though they are in a fight and it has been all in vain. They do not seem to have a clue. The Tories are still being left to write the story on the economy without the smallest whimper of protest from Labour. This Labour party is one of the weakest, least passionate, most pathetic letdowns we have had for a long, long time. And now some of the leadership wannabes are showing clear signs of agreeing with the tory lies. when the economy is clearly a massively important issue in any election, what is the sense in declaring “yes we are economically incompetent, the tories were right all along”?